Next comes Buddy Morrow’s “Hawaiian Eye,” the theme song to the TV show of the same name. 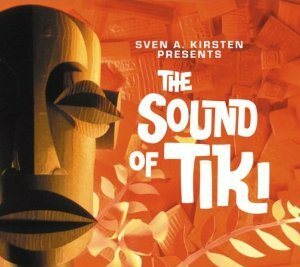 The accompanying notes detail the influence of Tiki culture on the show (as evidenced by the heavy use of animal calls in the opening) and vice versa. The Mary Kaye Trio’s “Hilo Boy” is a very corny song about a boy leaving his homeland in order to search the world for a bride (GUESS WHERE HE FINDS HER), but it does give Mr. Kirsten the opportunity to show their contribution to the birth of lounge music. Despite the band name, The Surfers’ “Ulili E” is not a surf song. Instead, it’s a traditional Hawaiian folk song (although not played in a way that one would associate with stereotypical folk songs). Paul Page brings us more steel guitar goodness with “Pieces Of Eight,” a song from an album he sold at select Polynesian-themed restaurants. You see, he name each song on the album after a restaurant he had an agreement with and sold the record under a different title at each location. Naturally, the album was called “Pieces Of Eight” when it was sold at the establishment under that name. Despite the name, Eden Ahbez’s “Full Moon” has no horror ties. Instead it’s a hippie/hermit-style exotica, complete with croaking frogs. The Surfmen’s performance of “Bamboo” is marred by the hilariously awful fake bird calls that sound like someone puking (which is one of the main reasons it was included on the CD). Next comes a Don Ho twofer, wherein he adds lyrics to the theme from Hawaii 5-0 and “Quiet Village.” The final track is a series of “Luau Is Calling You” radio jingles for a Polynesian restaurant.